The archaeological heritage of 42 states is celebrated each year during their respective archaeology months or weeks. April is Archaeology Month in Alaska, by proclamation of the governor. Educational posters are produced by each state to promote awareness of the value of archaeology and archaeological resources. Posters are sent to schools, libraries, agencies, and institutions throughout the state. Production of the annual Alaska Archaeology Month poster is coordinated by the Alaska Anthropological Association’s Public Education Group. Sponsors include the National Park Service, Ukpeaġvik Iñupiat Corporation, Colorado State University Center for Environmental Management of Military Lands, Bureau of Ocean Energy Management, Bureau of Land Management, University of Alaska Anchorage Department of Anthropology, the Alaska Office of History and Archaeology, and the Matanuska-Susitna Borough Cultural Resources Division. Since 2014 the subject of the poster has been a series of prehistoric cultural traditions. These are categories archaeologists have defined to describe distinct periods and ways of life inferred from Alaska’s 14,000 years of prehistory. Though wood resources across Alaska’s ecosystems varied-and much was treeless during the Ice Age and for millennia after, even to today-cultures found a way to get this versatile raw material, even if it was collecting what drifted in on the ocean. Then they used it to shape the objects that touched every aspect of their lives, from everyday activities like eating to special rituals and sacred moments like masked dancing and drumming and honoring ancestors. In the southeast, where cedars towered, totem poles and large wood plank lodges were possible. In the far north, where only shrubby willow and dwarf birch could survive, and along the treeless Aleutian archipelago, even smaller objects like spear shafts sometimes had to be stitched together from fragments of wood. More than 7,500 years ago, Alaska’s first maritime specialists emerged along the southern coasts. Called Ocean Bay—and the ancestors of today’s Alutiiq—they deftly navigated the Shelikof Strait and were the first to cross to Kodiak Island. Along the way, they took full advantage of the sea life variety the currents presented them: seals, sea lions, clams, otters, even porpoises on occasion. They used the skins to craft small boats in which they plied some of the most challenging and productive waters in the world, routinely facing off against big mammals with sharp teeth. Creating semipermanent settlements along the coasts, Ocean Bay people were pioneers of maritime skill and living that wouldn’t become common until millennia later. To master their watery environment, they quarried slate from outcrops where specialists refined the rock to create bayonets. Others crafted stone lamps that, when filled with sea mammal blubber oil, provided gathering places in the winter darkness. Other items became refined maritime tools as well: clam picks made of bone, sea mammal bone hooks for deep-sea fishing, and kelp fishing line. The Paleoarctic Tradition represents the first settlers of Alaska, 7,000 to 14,000 years ago. These people made a living hunting, trapping and fishing a smorgasbord of resources that included now-extinct species such as bison, wapiti (elk), and horse, along with extant species that include caribou, Dall’s sheep, waterfowl, small game, and fish. Recent archaeological finds show that Paleoarctic people had begun to exploit salmon, which in later millennia would become a major staple of Alaskan subsistence economies. 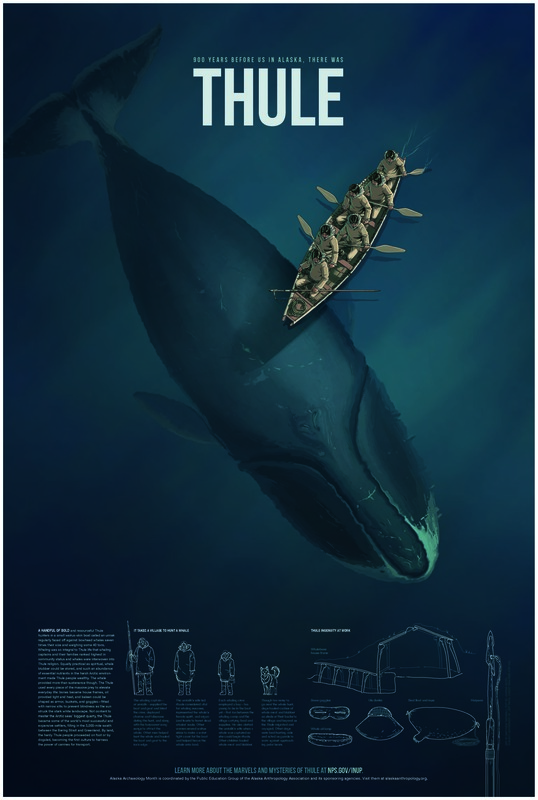 About 1,000 years ago bold and resourceful Thule hunters in small, skin-covered boats called an umiat regularly faced off against whales seven times their size and weighing some 40 tons. 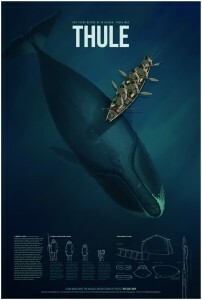 Whaling was so integral to Thule life that whaling captains and their families ranked highest in status in the community and whales were interwoven into Thule religion. Alaska’s 2016 poster was recognized as the best in the nation in the Society for American Archaeology‘s annual archaeology month poster competition. The Northern Archaic Tradition dates to approximately 3,000 to 6,000 years ago. This poster depicts hunters engaged in a cooperative caribou drive inspired by archaeological work in the Brooks Range at Agiak Lake. An entire volume of the journal Arctic Anthropology from 2008 provides a good and fairly recent summary of research on this period. Learn about Northern Archaic weapon technology through modern replication of stone weapon heads, darts and dart throwers by craftsman Tim Rast. Alaska’s 2015 poster was recognized as the best in the nation in the Society for American Archaeology‘s annual archaeology month poster competition. The Denbigh Flint Complex is an archaeological phase known from sites in western and northern Alaska that date to about 3000-4000 years ago. Distant ancestors of modern Inupiat and Inuit, Denbigh people pioneered new lands and innovated new technologies that set the stage for the next four millennia of high latitude living across the American Arctic. 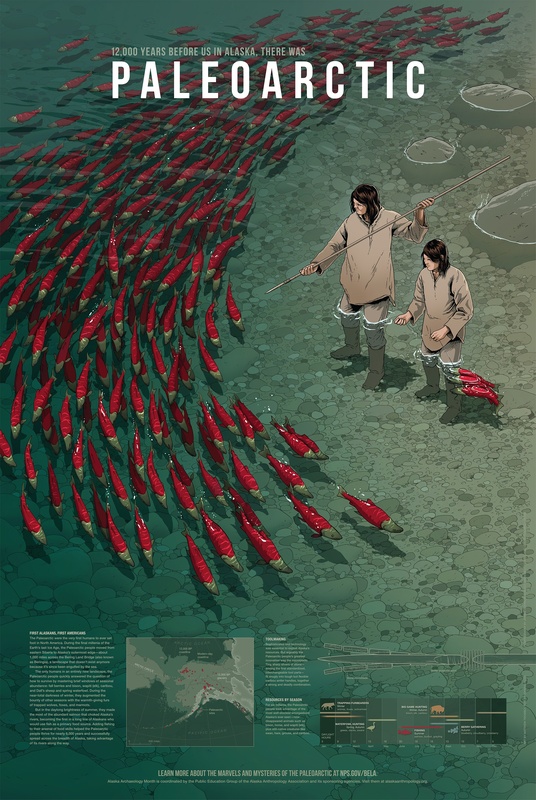 Alaska’s 2014 poster was recognized as the best in the nation in the Society for American Archaeology‘s annual archaeology month poster competition. The theme of the 2013 poster was the “Archaeology of Alaska’s Military Landscape,” specifically that of the Aircraft and Control Warning System. Built in the 1950s, the AC&W System was one of the first radar defense systems developed by the United States during the Cold War. The 2012 poster celebrated the 150th anniversary of the Homestead Act (1862-2012). Homesteading played an important role in Alaska’s history between 1898 and 1986. This poster was produced by the Bureau of Land Management’s Alaska Region. 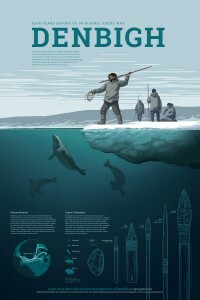 The 2011 poster theme revolved around mammoth hunting and coincided with the Anchorage Museum’s Mammoths and Mastodons: Titans of the Ice Age Exhibit. The poster features original artwork by Anchorage artist Maureen Howard and images from numerous archaeologists (Dr. Jason Rogers, Dr. Chuck Holmes, Randolph Tedor, Dr. David Yesner, and Travis Shinabarger). The poster was designed by Meg Anderson, graphic designer for the Alaska Department of Natural Resources’ Division of Parks and Outdoor Recreation. Financial support for this poster was provided by the Alaska State Office of History and Archaeology, the National Park Service, the US Fish and Wildlife Service, the Matanuska-Susitna Borough, and Dr. David Yesner. It was produced by the Office of History and Archaeology. The theme of the 2010 poster was Alaska’s World War II archaeology. The poster was designed by Dirk Spennemann, and produced by the National Park Service. Celebrating the anniversary of Alaska Statehood (1959-2009), this poster depicts some of the more famous early archaeological sites that have been discovered in the past fifty years: Mesa, Onion Portage, Broken Mammoth, Swan Point, Dry Creek, Tangle Lakes, On Your Knees Cave, and Anangula. The poster was produced by the Bureau of Land Management. Financial support was provided by BLM and the National Park Service. The 2008 theme was “Traveling Through Time on the Iditarod Trail.” The Iditarod National Historic Trail extends approximately 1000 miles across the state of Alaska, connecting Anchorage to Nome. Today the annual Iditarod dog sled race (~1,100 miles) follows much of this historic route. 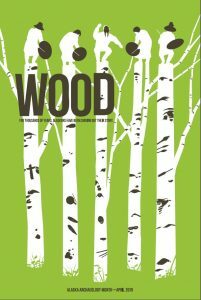 The poster was designed by Dr. Linda Finn Yarborough, Charles Lindemuth (both of Chugach National Forest), and Dr. Bob King (Bureau of Land Managment). Other contributors included Chugach NF employees Annette Heckart, Heather Hall, Shawn Kenney, and Mona Spargo. Photos were provided by BLM, Chugach NF, the Alaska State Office of History and Archaeology, and the Matanuska-Susitna Borough Cultural Resources Division. The 2008 Alaska Archaeology Month poster won 1st Place in the Society for American Archaeology’s Annual State Poster competition – the first time Alaska has received the award. The theme of the 2007 poster was “Culture and Change: Maintaining Values.” This poster won 3rd Place in the Society for American Archaeology’s Annual State Poster Competition. The 2006 poster celebrated the 100th Anniversary of the Antiquities Act (1906-2006). This poster won 2nd Place in the Society for American Archaeology’s Annual State Poster Competition. 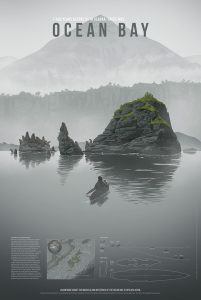 The theme of the 2005 poster was “Lighting Up the Past.” It showcased the use of digital enhancement technology in analysis of pictographs and petroglyphs, specifically at Pictograph Cave in Southeast Alaska’s Prince of Wales Archipelago. 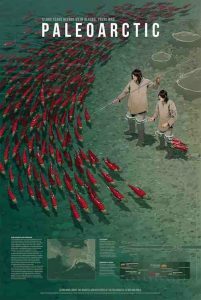 The poster was designed by Carolynne Merrell, Julene Ewert, and Terry Fifield (all of Tongass National Forest). Financial support came from the USDA Forest Service, National Park Service, Bureau of Land Management, Alaska State Office of History and Archaeology, US Fish and Wildlife Service, Matanuska-Susitna Borough, US Air Force, and US Army.